the smallest I’ve seen, yet they last for about three hours each. The second difference is that these candles have odor control formula. They do not have strong scent that will overpower unwanted smells; instead, their gentle fragrance has an ingredient that kills odors. The candles are sold in packs of 6, but first you will need to purchase a pack with the glass holder that you use to place the candles on. That pack contains the holder and two candles. the house, especially in winter when I cannot open windows the candles create a similar effect. No more stale air, the whole house smells fresh. 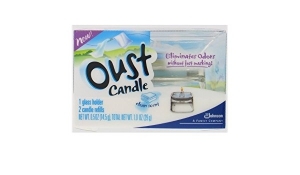 I would recommend Oust candles as an air-freshening product to those who do not like strong fragrances.